As the guidebooks are fond of reminding us, it's the 'tallest freestanding stone column in the world'. But the Monument is much lower down the list of tourist attractions than, say, Nelson's Column. Frankly, it's the sort of C-list memorial that might appear on Celebrity Big Brother, if they decided to trade non-sentient human eye-candy for its equivalent in stone. And it's got a history of slagging off minority groups, too. A plaque on its base once declared that the Great Fire had been started by papist treachery. Perhaps one reason the Monument is not a mandatory part of the tourist circuit is its feeble surroundings. 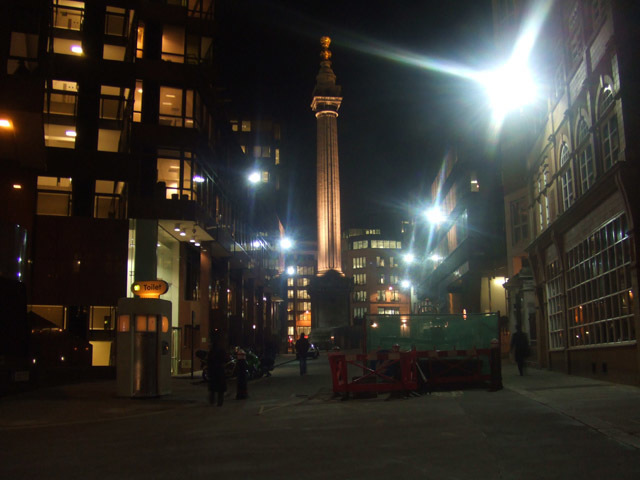 Where's the museum commemorating the Great Fire? Is there even a plaque on Pudding Lane? 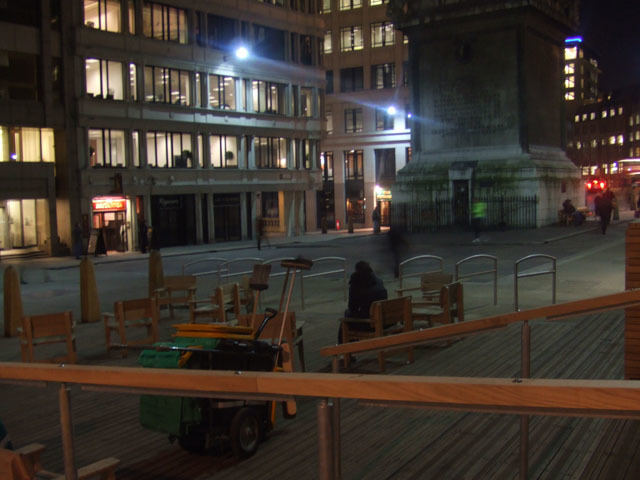 Well, lo and behold, the City of London has done something about it. Today, they unveiled Monument Square - the new look pedestrianised surroundings for the pillar. It's all a bit naff, frankly. The glass pavillion (not pictured - there seemed no point) is a cross between a diabled toilet and a security office. And the wooden seating area looks like it involved all the planning of a Sunday visit to B&Q. We're told you have to climb the Monument on a sunny day to fully appreciate the new space. Something to do with the crowning flame reflecting in the pavillion's ceiling. But it still seems like a missed opportunity. The Great Fire is one of the most evocative and improtant events in London's history, and deserves world class facilities.